﻿ Pyramid Hill Sculpture Park and Museum - Ohio. Find It Here. Pyramid Hill Sculpture Park is an outdoor museum combining the lure of nature with the dynamic presence of monumental art. Located in Southwest Ohio on 300+ acres of woodlands, gardens, and lakes, Pyramid Hill is a unique and ever changing venue for outdoor art and exploration. The rolling hills are traversed by miles of roadways, trails, and picnic areas. 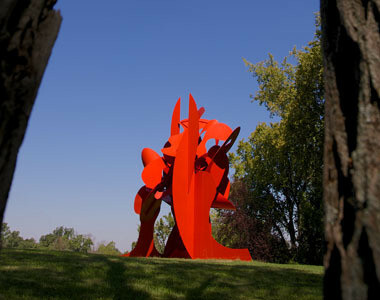 Visitors can rent an Art Cart, or hike amongst the woods and marvel at over 65 monumental sculptures.Throughout the year, Pyramid Hill provides special events for all ages including the annual Fall Art Fair and the Holiday Lights on the Hill.Since its creation, the park has grown in acreage and sculpture diversity. It has gained a national and international reputation. As part of your visit make sure to see the Ancient Sculpture Museum, a truly unique museum where art is in harmony with architecture. The unusual layout of galleries and Garden Court allows you to move with ease among the exhibits.